T.E.N.S. - TENS Electrodes - EMS Electrodes - T.E.N.S. and E.M.S. Pre-Gelled Electrodes, 40/pkg, Square 2" x 2" adhesive pads for TENS & EMS. Pre-Gel Adhesive Electrodes. Square 1.75" x 1.75"
Large Butterfly Electrodes offer greater coverage area. Packaged 10 per box. Large Butterfly Electrodes measure 6" X 4". 4 per package or save on package of 8. Electrodes Adhesive Pre-Gelled Round 2"
TENS and EMS Lead Wires, package of 6. Fits all TENS and EMS. 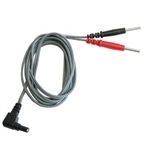 1.5" X 6" Lower Back Electrodes - 8 per package or save on pack of 16. Works on both TENS and EMS units. Electrode Adhesive Pre-Gelled Electrodes for TENS or EMS. 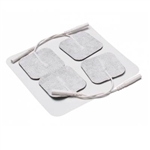 Rectangular 2" x 4.15"
Soft Touch Electrodes work on any TENS or EMS Units. Measure 1.5" X 3.1" sold 16 per pack. Soft Touch TENS & EMS Electrodes. 2" Round. Sold in packs of 16 or save on 32 electrodes. 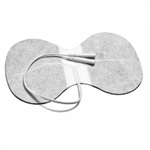 Soft Touch 2" x 2" Electrodes for TENS & EMS. 16 per package or save on package of 32. Electrodes for T.E.N.S. & E.M.S.